Yesterday, in Israel, and today in the US, my Jewish friends celebrated and are celebrating Simchat Torah. A holiday that marks the conclusion of the annual cycle of public Torah reading, and the start of the new cycle. In English it is called Rejoicing with the Torah. The main celebrations take place in a synagogue. During evening and morning services, when the ark, which holds the Torah scrolls is opened, the people dance and sing with the scrolls. As I scanned through social media yesterday, my eyes beheld pictures of this worship. Such joyous observance of the Word of G-d.
Today in a small town somewhere in the US, me, a follow of Jesus, who has been enlightened about Israel, Judaism, and Hebrew over the last year and half completed reading the Torah as well. Not only did I finish the Torah, which is the first five books of the Bible, I also completed the Nevi'm or in English, the Prophets, and the Ketuvim or Writings. These books complete the full Hebrew Bible, known as Tanach. Tanach is an abbreviation for the three parts of the Bible. I was taught that the Prophets and Writings are referred to as Nach. I also read all the books of the New Testament. In other words, I have spent the last year reading both the Old Testament and the New Testament. 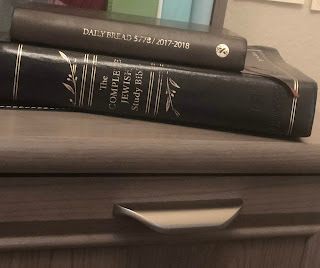 I did not sing and dance as I closed my journal that guided me in my readings this morning, but I wrote in it, words from Joshua 1, "Be strong, be bold". I scribbled Todah Rabah, which means thank you very much. I don't share this with you to pat myself on the back, it is only G-d. I share this to encourage you to read your Bible with different eyes. Along with reading each portion, I listened every week to the Lone Star Podcast. This podcast brought together a Rabbi and a Pastor, who studied the portion each week. This time spent in the Word and listening to this podcast has blessed me in numerous ways. I have completed this reading before, however, I would get sleepy eyed as I read through the Old Testament, not grasping the significance of the words nor gaining insight to who G-d is. I had a lack of understanding. As I grew in my faith, I grew to appreciate the Old Testament more, but never like I have this year. Learning to grasp the Jewish roots of my faith, has opened up the beauty and truth of the different portions of the Old Testament. Learning Hebrew has increased my desire to read the language and increased my knowledge and excitement. Understanding the language of the Bible is life changing. I have learned to study the Bible better by listening to the podcast mentioned. And in all of this I have learned more about the character and heart of G-d. I remember finishing the book of Leviticus this year and asking Rabbi Dov Lipman the following question, do you every get sad when the reading of a book of the Torah is over? We spent so much time in each book, it was bittersweet for me, sad to be done with one book yet excited to read the next. His response was, "No. I don't get sad. We continue to the next one." This appreciation of each book, only stems from G-d and Him allowing me to understand the Jewish roots of my faith. Thank you so much to all my friends, acquaintances, and future friends who have helped and will help me grow in my faith by allowing me into yours. Thank you to the Lone Star Podcast for to teaching me so much this year as I read along. And todah rabah Hashem for Your Word. On July 8, 2018 I completed my second year with Precision Nutrition. It has been a tough year, but a good one. I went into this year thinking it would be more about weight loss and less about changing in other ways since I already went through an entire year of the program. Boy, was I wrong!! In my first round with this organization I learned a lot and changed my relationship with food. One of the lessons I learned, is that transformation is not about the latest diet, but about changing from the inside out. Part of that for me is learning to let Jesus heal the places I have only allowed food to touch. I deepened this transformation in this second year. One way I did this was continuing to train for a half marathon that I agreed to in May of 2017, towards the end of my first year of Precision Nutrition. I also completed a program called The Road. The Road helped me break free from baggage that held me back. Completing The Road, continued the inside out transformation that had already begun. Training for the half marathon took it deeper. It gave me a place of solitude where I could wrestle out thoughts and struggles. I blasted music and listened to sermons. As I wrote in one post, it gave me space to clear my mind. It challenged me. This training seemed impossible, because I had previous knee surgeries and asthma, but this training taught me about possibility and endurance. G-d called me to this race and He helped me finish. Impossible became possible. I learned more about trust in this round of PN coaching. Trusting G-d, trusting the process, and even trusting myself. To deepen my internal transformation, the Lord took me outside of my comfort zone again by asking me to go to Israel. I had only been out of my home state a handful of times, I never had a passport, and I hate to fly. But like the half marathon, G-d called me to this and He helped me finish. Again, impossible became possible. Transformation from the inside out has out weighted the numbers on the scale again in round two. Overall my health is about the same, even my weight in the end as ended up about the same. However, as I look back over the year I am a half marathon finisher, I have now been working out consistently for 2 years. In terms of nutrition I have had many changes, going gluten free, diary free, egg free, and even caffeine free due to sensitives. I have had a lot going on personally this past year, but I have learned I don't have to give up because life happens. So no, maybe I didn't have huge scale success, but in the words of my PN Coach, "I gained invaluable experience for situational awareness and self understanding". PN is about living your best life, and as I look back over the last year, I certainly lived an amazing one. Again in the words of my coach, " ...maybe the biggest success you've had is this: You haven't put your life on hold until that happens." Meaning I haven't waited to see a certain number to be confident in who G-d says I am. I haven't waited to see a certain number to run a race. I haven't waited to see a certain number to say yes to follow G-d, even across the world to Israel. 1st picture is beginning of my first year with PN, 2nd is end of 1st year, 3rd is end of 2nd year. I am thankful for the last year and look forward to seeing what is to come. I do not plan on doing a 3rd year with Precision Nutrition, but I plan on continuing to work out and eat good food. I am not following a certain plan per se. I believe in what I call reality eating, but I did find a nutrition plan through my beach body friends that gives me a good template to work with to keep myself in check. Basically, I am going to keep fighting and keep trusting. I know that even in regards to numbers, one day impossible will become possible.